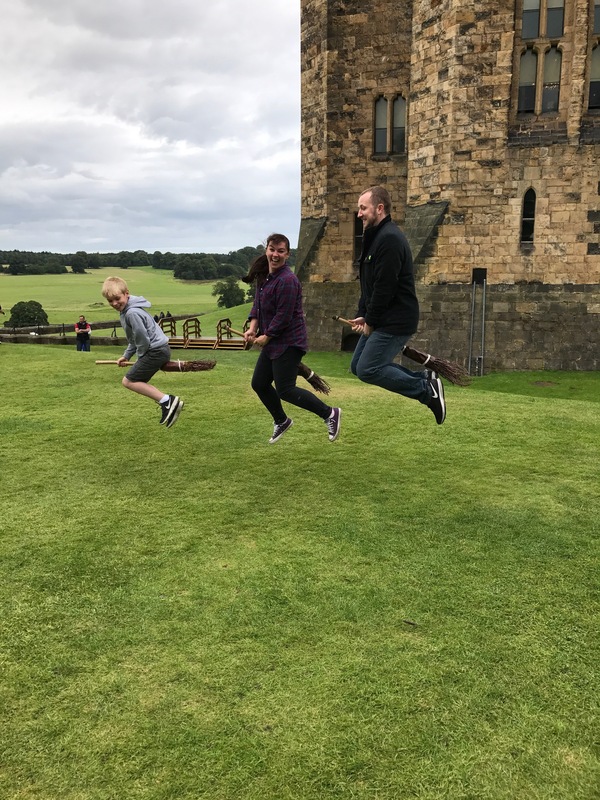 If you read my Summer Holiday Update you will know we spent a day at Alnwick Castle recently. I did say I would write a post about our trip there, so here it is as promised! Alnwick Castle is situated in the town of Alnwick in Northumberland. It’s more than a visitor attraction, there’s a family (the Percy’s) who have lived here for over 700 years. Can you imagine living in the same rooms as your great-great-grandparents? When you look inside the castle you can see their personal touches, from family photos to the well stocked drinks trolley in the Library. It’s in there you remember you are in someones home! Along with the castle, on the site there is The Alnwick Garden which is a day trip in itself. As well as being a proper castle, Alnwick Castle has some pretty impressive claims to fame. The castle was featured in Harry Potter and the Philosopher’s Stone and Harry Potter and the Chamber of Secrets. It was also used twice in Downton Abbey as the setting for the fictional Brancaster Castle. We followed the sat nav to the castle car park, as recommended by the Alnwick Castle website and we got a £3 ticket for the full day. It was really easy to find the car park using the sat nav so we avoided some stress there! The car park was for both the castle and the Alnwick Garden but there was plenty of spaces at 10.30 on the Sunday morning. I would guess if you arrived later you might struggle to get parked, but there were parking attendants to direct visitors. We visited with Dan’s mum and sisters who were staying nearby, they used parking in the town which was free. If you know the area then this could be worth doing to save money (to spend on ice cream later?). Children 4 and under are free, so we didn’t have to worry about Grace, but we did buy a family ticket as Dan’s sister is (just) in the child bracket so it worked out a bit cheaper for the group of us. For the family ticket we paid £37.80 online (it would have been £42 on the day) which I don’t think is too bad for 4 people. But it gets better. You can get the ticket validated and it becomes a 12 month pass. I think £37.80 for a year is excellent value for money! We picked a day to visit Alnwick Castle which wasn’t great weather-wise but there was plenty to do to keep us entertained. The thing we were most interested in was Broomstick Training which was a ticketed activity. We headed straight there to get tickets for later in the day so we didn’t miss out. We then went to the Knight’s Quest area to take part in the Dragon’s Quest. Again, you need tickets for the Dragon’s Quest, but we were able to get them for only 20 minutes later. This gave Oliver time to get prepared as a knight ready to battle a dragon. The Dragon’s Quest was aimed at children, but young children might find it a bit scary. The storyline was good as you moved through and it had some good special effects. It lasted about ten minutes all together. I’d like to be able to go back and see it for myself, hopefully I can go through next time. The Knight’s Quest was a courtyard area which featured lots of fun things for children to look at and do, as well as a few picnic benches. There were fancy dress costumes to put on, stocks, and a display of armour and weaponry which fascinated Oliver. When we visited there was also a tile making activity and some of the staff were making wooden items with lathes. There were also two plays of the story of Harry Hotspur who was born at Alnwick Castle around 1364, who features in the Shakespeare play King Henry IV. This was good fun, although we had to quickly dodge a shower of rain half way through! The only negative to this area was that most of the courtyard was pebbled, so it made getting round with the pram a bit of a struggle. There were three birds of prey displays on the day we attended, and we caught one at 1.30. It was situated on a large grassy area as you first come into the castle, so a great location to grab people’s attention and a big space to see the birds flying around. The handlers of the birds were really knowledgeable and Grace really enjoyed watching them. The archery was next to the birds of prey display and had an additional fee. Dan, Oliver, and Dan’s sisters all queued up for a go. It was £3 each for 8 arrows, which Dan didn’t think was too bad. This was for children 9 and over, and adults (so we may have had to add a couple of months onto Oliver’s age), but I guess the age limit was for safety purposes. Oliver managed the activity really well, and enjoyed it a lot. I think they each got about 15 minutes to fire their arrows, but they weren’t rushed at all and the instructors explained what they had to do really clearly. Definitely a winning activity in our eyes! We had a little bit of time to kill before our broomstick training began so we did a bit of sightseeing round the outside the castle. We also took a couple of family photos, as those NEVER happen! The weather was getting a bit cooler but Oliver still had fun playing around all the cannons. So, finally, we got to go to our broomstick training session. Me, Oliver and Dan’s sister had been looking forward to it all day, and it didn’t disappoint. It was so much fun! Now, I’d like to tell you ALL about it, but then that would spoilt it if you did go to Alnwick Castle and take part, so I’ll just tell you a few bits. The “professors” were brilliant, totally into their characters and had me laughing all the way through. I think a lot of the jokes went over the children’s heads… maybe they were just concentrating too hard? We were given lots of different things to do to become experts at flying our broomsticks, and of course I’m now a professional! As Harry Potter fans, this really did make our trip. Knowing the cast stood pretty much where we did in the Philosopher’s Stone having their first broomstick lesson was pretty special! And, look! We can fly! After our strenuous broomstick training we decided we needed a sit down in the cafe, and maybe some cake. I have to be honest and say this was the one area I was a little disappointed with. The cafe is open 10am to 4pm according to the Alnwick Castle website, and we got there around 2.30. There was very little choice of food available so we were pretty disappointed. We ended up just buying a couple for drinks, a cookie and an ice cream. The hot food was being taken off the counter, and there was only a small selection of sandwiches left. There was plenty of ice cream, and the mint chocolate chip I had admittedly was delicious but I wasn’t impressed overall. We struggled with seating, as we had the pram and the seats were on different floors to the entrance. There was seating outside, but as it was raining this was off the cards. Also, the cafe was boiling hot. It was pretty uncomfortable for most of us. Of course, as in any popular tourist attraction, the gift shop was heaving. I don’t think things were too badly priced though, and there were lots of options for things to buy. Oliver wanted it all! We settled in the end for a dragon in a cage and a notepad and pen. These together came to under £6 which is about the amount I try to stick to in a gift shop. If I had given him free reign though we would have come home with everything from swords and bow and arrows to Harry Potter snow globes! The final thing we did on our visit to Alnwick Castle was look round the state rooms. You begin by going up a pretty impressive staircase and you get to look at rooms such as the Library and the Dining Room. It’s amazing to see the decor and size of the rooms. I like to imagine all the fancy dinners and parties the family might have thrown. Unfortunately no photographs are allowed in the state rooms, so I can’t show you how amazing it all is. We loved our day at Alnwick Castle. I would definitely recommend it. The only downside was the weather, but we didn’t expect it to be great, and the cafe. If you were to go, definitely get your ticket validated to a year pass. I can’t wait to go back! That broomstick training looks like stacks of fun. I visited the Alnwick Garden a year ago. I thought it was expensive to enter compared to many other attractions in the region but enjoyed mooching around there. I think we are a bit spoiled with so many free museums and good value activities in the North East aren’t we! Getting the Castle ticket validated to a year pass definitely made it worth the money for us as we had such a good day, I don’t think we would have enjoyed the garden as much.